The Alaskan landscape is changing, both in terms of effects of human activities as a consequence of increased population, social and economic development and their effects on the local and broad landscape; and those effects that accompany naturally occurring hazards such as volcanic eruptions, earthquakes, and tsunamis. Some of the most prevalent changes, however, are those resulting from a changing climate, with both near term and potential upcoming effects expected to continue into the future. Alaska’s average annual statewide temperatures have increased by nearly 4ºF from 1949 to 2005, with significant spatial variability due to the large latitudinal and longitudinal expanse of the State. Increases in mean annual temperature have been greatest in the interior region, and smallest in the State’s southwest coastal regions. In general, however, trends point toward increases in both minimum temperatures, and in fewer extreme cold days. Trends in precipitation are somewhat similar to those in temperature, but with more variability. On the whole, Alaska saw a 10-percent increase in precipitation from 1949 to 2005, with the greatest increases recorded in winter. The National Climate Assessment has designated two well-established scenarios developed by the Intergovernmental Panel on Climate Change (Nakicenovic and others, 2001) as a minimum set that technical and author teams considered as context in preparing portions of this assessment. These two scenarios are referred to as the Special Report on Emissions Scenarios A2 and B1 scenarios, which assume either a continuation of recent trends in fossil fuel use (A2) or a vigorous global effort to reduce fossil fuel use (B1). Temperature increases from 4 to 22ºF are predicted (to 2070‒2099) depending on which emissions scenario (A2 or B1) is used with the least warming in southeast Alaska and the greatest in the northwest. Concomitant with temperature changes, by the end of the 21st century the growing season is expected to lengthen by 15–25 days in some areas of Alaska, with much of that corresponding with earlier spring snow melt. Future projections of precipitation (30‒80 years) over Alaska show an increase across the State, with the largest changes in the northwest and smallest in the southeast. Because of increasing temperatures and growing season length, however, increased precipitation may not correspond with increased water availability, due to temperature related increased evapotranspiration. The extent of snow cover in the Northern Hemisphere has decreased by about 10 percent since the late 1960s, with stronger trends noted since the late 1980s. Alaska has experienced similar trends, with a strong decrease in snow cover extent occurring in May. When averaged across the State, the disappearance of snow in the spring has occurred from 4 to 6 days earlier per decade, and snow return in fall has occurred approximately 2 days later per decade. This change appears to be driven by climate warming rather than a decrease in winter precipitation, with average winter temperatures also increasing by about 2.5ºF. The extent of sea ice has been declining, as has been widely published in both national and scientific media outlets, and is projected to continue to decline during this century. The observed decline in annual sea ice minimum extent (September) has occurred more rapidly than was predicted by climate models and has been accompanied by decreases in ice thickness and in the presence of multi-year ice. This decrease was first documented by satellite imagery in the late 1970s for the Bering and Chukchi Seas, and is projected to continue, with the potential for the disappearance of summer sea ice by mid- to late century. A new phenomenon that was not reported in previous assessments is ocean acidification. Uptake of carbon dioxide (CO2) by oceans has a significant effect on marine biogeochemistry by reducing seawater pH. Ocean acidification is of particular concern in Alaska, because cold sea water absorbs CO2 more rapidly than warm water, and a decrease in sea ice extent has allowed increased sea surface exposure and more uptake of CO2 into these northern waters. Ocean acidification will likely affect the ability of organisms to produce and maintain shell material, such as aragonite or calcite (calcium carbonate minerals structured from carbonate ions), required by many shelled organism, from mollusks to corals to microscopic organisms at the base of the food chain. Direct biological effects in Alaska further along the food chain have yet to be studied and may vary among organisms. Some of the potentially most significant changes to Alaska that could result from a changing climate are the effects on the terrestrial cryosphere—particularly glaciers and permafrost. Alaskan glaciers are changing at a rapid rate, the primary driver appearing to be temperature. Statewide, glaciers lost 13 cubic miles of ice annually from the 1950s to the 1990s, and that rate doubled in the 2000s. However, like temperature and precipitation, glacier ice loss is not spatially uniform; most glaciers are losing mass, yet some are growing (for example Hubbard Glacier in southeast Alaska). Alaska glaciers with the most rapid loss are those terminating in sea water or lakes. With this increasing rate of melt, the contribution of surplus fresh water entering into the oceans from Alaska’s glaciers, as well as those in neighboring British Columbia, Canada, is approximately 20 percent of that contributed by the Greenland Ice Sheet. Permafrost degradation (that is, the thawing of ice‑rich soils) is currently (2012) impacting infrastructure and surface-water availability in areas of both discontinuous and continuous ground ice. Over most of the State, the permafrost is warming, with increasing temperatures broadly consistent with increasing air temperatures. On the Arctic coastal plain of Alaska, permafrost temperatures showed some cooling in the 1950s and 1960s but have been followed by a roughly 5ºF increase since the 1980s. Many areas in the continuous permafrost zone have seen increases in temperature in the seasonally active layer and a decrease in re-freezing rates. Changes in the discontinuous permafrost zone are initially much more observable due to the resulting thermokarst terrain (land surface formed as ice rich permafrost thaws), most notable in boreal forested areas. Climate warming in Alaska has potentially broad implications for human health and food security, especially in rural areas, as well as increased risk for injury with changing winter ice conditions. Additionally, such warming poses the potential for increasing damage to existing water and sanitation facilities and challenges for development of new facilities, especially in areas underlain by permafrost. Non-infectious and infectious diseases also are becoming an increasing concern. For example, from 1999 to 2006 there was a statistically significant increase in medical claims for insectbite reactions in five of six regions of Alaska, with the largest percentage increase occurring in the most northern areas. The availability and quality of subsistence foods, normally considered to be very healthy, may change due to changing access, changing habitats, and spoilage of meat in food storage cellars. These and other trends and potential outcomes resulting from a changing climate are further described in this report. In addition, we describe new science leadership activities that have been initiated to address and provide guidance toward conducting research aimed at making available information for policy makers and land management agencies to better understand, address, and plan for changes to the local and regional environment. This report cites data in both metric and standard units due to the contributions by numerous authors and the direct reference of their data. 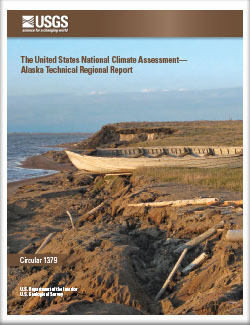 Markon, C.J., Trainor, S.F., and Chapin, F.S., III, eds., 2012, The United States National Climate Assessment—Alaska Technical Regional Report: U.S. Geological Survey Circular 1379, 148 p.
Arctic Climate Change—A New Normal?